Many experienced anglers who have fished the premier trout waters of the United States consider the Clinch River tailwater to be one of the finest trout fisheries in the country. It is a challenging river to flyfish. The clear, shallow, slow moving Clinch demands a stealthy approach, delicate presentation, small flies, and drag-free drifts. It is very much like fishing a spring creek, but this “spring creek” is over 75-yards wide! To consistently catch its wild, wary rainbow and brown trout requires concentration, careful execution, and patience. The Clinch tailwater is 13 miles in length and flows from Norris Dam, at River Mile 80, to the Highway 61 Bridge near Clinton, TN, at River Mile 67. The upper reaches of Melton Hill Reservoir extend to the Highway 61 Bridge where the Clinch changes from riverine character to slack water. Clear Creek is a small (two yards in width) coldwater tributary that flows into the Clinch about one mile below Norris dam. Clear Creek drains the City of Norris Watershed and is the water supply for the city. While the stream is small and summer flows sometimes are nothing more than a trickle, it does have decent winter and spring flows and has historically been used by spawning rainbow trout. Adult fish typically enter the stream in early December and spawning can continue on into February. While a number of fish successfully spawn in this stream, its small size does not support significant numbers of spawning fish. Coal Creek flows into the Clinch about three miles below Norris Dam. It is a warm water stream; but in winter and spring, trout enter the stream and move into its upper reaches. It is believed that some of these fish spawn in the creek, but spawning has not been documented. Coal Creek drains a watershed of about 35 square miles. This watershed has been impacted by coal mining and is a source of silt and metal runoff into the Clinch. Cane Creek is the next major tributary that flows into the Clinch downstream from Coal Creek. It drains a smaller watershed than Coal Creek, and mining has not impacted the Cane Creek watershed. It drains farmland (pasture) and rural residential properties. Cane Creek is a warm water stream, but trout have been found in the stream in winter and spring; and trout may spawn in the stream. Hines Creek flows into Melton Hill Lake about one mile below the Highway 61 bridge (about 14 miles below Norris Dam). It drains a large watershed which is primarily farmland (pasture) and rural residential in land use. It is a warmwater stream, but trout are caught in the creek in winter. Spawning activity has not been documented. All streams are gradient freestone streams, which can offer a pleasant days’ hike along with a remarkable day of fishing. These waters include Whitetop Laurel, Tennessee Laurel, and Beaver Dam. 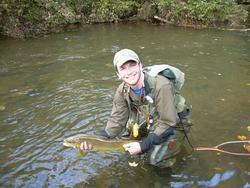 Whitetop Laurel Creek is considered to be the largest wild trout fishery in Virginia. Its runs parallel with the scenic Virginia Creeper Trail. John Ross, author of “Trout Unlimited’s Top 100 Trout Streams,” lists this stream in the top 100 greatest trout streams. It is noted for its prolific early season Green Drake hatch which can range in size from a #8-#12 fly. Tennessee Laurel is a winding creek that runs parallel with route 91. This stream is a very productive stream filled with large browns and feisty rainbows. Nymph fishing is very popular for this creek, due to its deep holes and swift water. Anglers have a tendency to use large #12-#14 bead head nymphs for extra weight with the indicator running at least three foot above the fly. Beaver Dam is well renowned for its beautiful rock tunnel, Backbone Rock. This is a very beautiful stream that is flawlessly decorated with vast boulders. This creek has various types of runs. While the lower section of Beaver Dam is slightly larger than the other streams, the upper section has a spring creek atmosphere, with a very similar fishing style. Of the three streams, Beaver Dam is known for holding the larger trout. With streams such as; Whitetop Laurel, Tennessee Laurel, and Beaver Dam, as well as tailwaters fishing, it is obvious why some consider Southwest Virginia and East Tennessee to be the finest fishing on the east coast. Each stream offers its own array of landscape, wildlife, and gorgeous trout. Fly fishing guide and fly fisherman outfitter in Gatlinburg Tennessee – trout fishing guide for the Great Smoky Mountains rainbow, brook and brown trout. The same stretch of the Clinch River that produced the state-record trout remains one of the finest trout streams in Tennessee — and it may be getting better! The Volunteer State has great fishing all year ’round. These 36 destinations — 3 for each month — promise topflight fishing for Tennessee anglers. When winter days are cold, the swift tailwater section below several Tennessee dams provide hot action for heavyweight striped bass. When temperatures plunge, baitfish head for the warmwater discharges of steam plants and nuclear plants. Wise anglers do the same. From the Alabama border all the way to Kentucky, the northerly flowing portion of the Tennessee River serves up super bassin’ action early in the year. Flies and tactics for the Tellico River, one of the largest natural trout streams in the southeast. Mountain streams and big tailwaters often overshadow the excellent lake fishing our state has to offer trout anglers. Whether you’re up for chasing smallmouth bass in subfreezing temperatures, during the spring spawn, all night long in the heat of the summer, or on rivers in the fall, it’s always brown bass season. Wherever you live in Tennessee, prime-time largemouth waters are not far away. The Clinch and Cumberland river systems have perhaps the best freshwater trophy-striper fisheries in the world. A world record could come from these waters any time. Spring largemouth fishing in Middle Tennessee is in full swing. Don’t miss the fishing at these three hotspots! Jim Duckworth firmly believes in the “big bait, big fish” theory when he’s trolling for trophy striped bass on the Cumberland River. From mountain streams to tailwaters to lakes, Tennessee offers a little bit of everything for trout anglers. Although there are uncounted numbers of good places to catch smallmouths in Tennessee, these two lakes take top billing in the winter.